E-Design is a great way for a client to enjoy the design skills and knowledge of White Space Design Group without taking the approach of full service and in-person design. E-Design can be a wonderful option for the out of area client. Each design is still completely custom and personal to the client's individual needs and will be communicated with the same clarity and professionalism as our in-person designs. 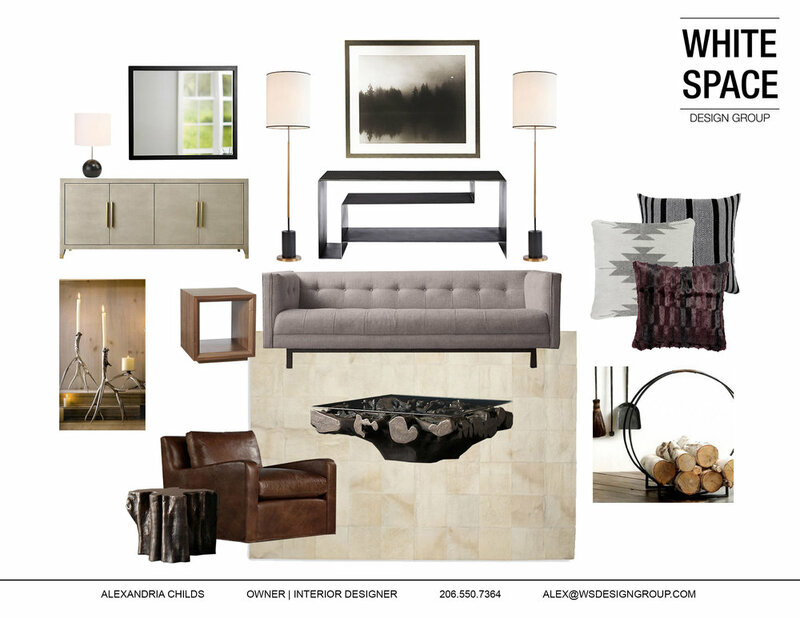 First, you complete a visioning questionnaire, this will help us to establish the design goals for your space. Next you will measure your space (we'll show you how) and send us pictures. After these things are complete, we will establish a timeline, budget and design plan. The following will be included in our basic design package (including one revision if required). This digital 'board' will help you to see what the final space will look like. We will artfully craft images of the furniture, accessories, art and fixtures to convey to you how your new lovely space will feel. This is an important piece to make sure that we are giving you the look and feel that you love. These detailed digital plans will show furniture placement, dimensions, and any notations needed to convey how the space is laid out and will function. The plans will directly reference and relate to the pieces on your concept board as well as your furniture spec sheet (shopping list). This is essentially your shopping list and will include pricing, links and details on all the pieces needed to complete your space. For an additional fee, we can also help facilitate the ordering for you, or you can implement the orders on your own time and schedule. Fill out the form below and tell us about your E-Design project. Then we'll follow up with you about scheduling a phone call and generate a fee proposal specific to your project.